Our work is the product of artistic collaboration between the photographer and printer. Meet the team that brings the art to life. Each collection represents an artistic exploration of form and composition, from Night Blooming Flowers to the Four Greek Elements. Explore them all at the Collections link above. 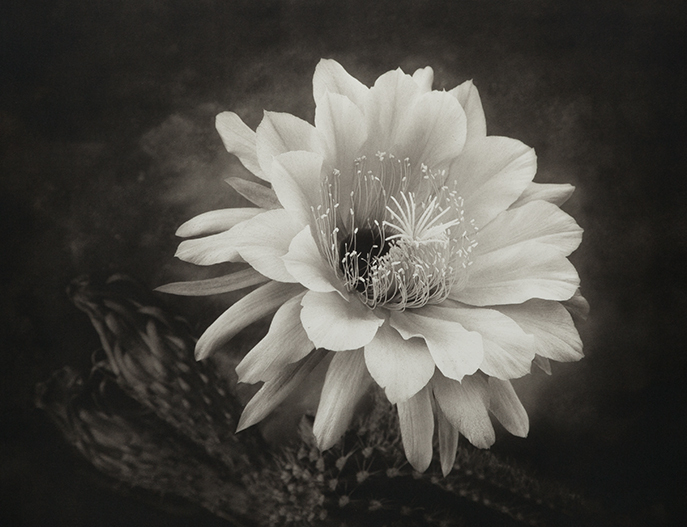 Flowers that bloom in the night, printed in the historic platinum process. The flowers in this series open at night or early evening. Some of the blooms will die by early morning; some will stay open for a few hours the next day. Because of the wide gray scale possible with the platinum process, these prints offer delicate detail in the highlights of the flowers and velvety rich darks in the shadows of the leaves. — Mary Abbe, Minneapolis Star Tribune. • A series of eighteen images printed in platinum-palladium in an edition of 30 numbered prints. • Image size (excluding the black border) is 21" x 16" on 30" x 22" Arches Platine paper. • Individual prints are available unframed $3500. Please contact us, or one of the galleries that represent Cy, for further details or to purchase prints.